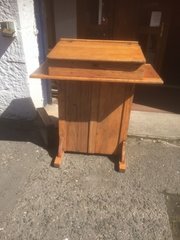 42" x 21" x 29.5"
Scottish Victorian pitch pine good quality lowland kitchen dresser with lower cupboards / drawers and upper drawers. Has the original brass exterior hinges on the doors. Could be used in the kitchen , bathroom , office , hallway etc. or anywhere good storage is required. 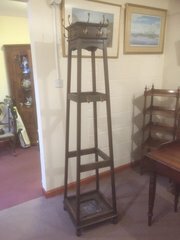 A well made unit with dovetail drawers and mortice and tennon top / sides Presently on castors Circ 1860. Victorian Mahogany Ogee chest of drawers, in excellent condition. 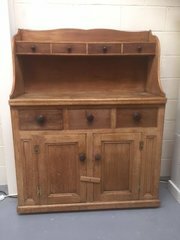 Late Victorian teachers lecturn desk with lockable cupboard and desktop in very good condition . Would make a real quirky reception desk for a hairdresser , restaurant , tattooist or for doing presentations at a conference. 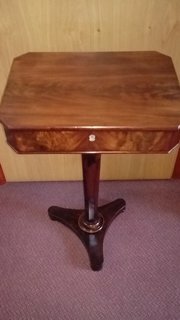 Antique Victorian Mahogany Sewing Table, This Victorian mahogany sewing table has a rectangular top which lifts and revels compartments for your sewing with ivory fittings. Very early 17th century oak settle which is in a completely original "unrestored" condition meaning it can be waxed , stained , coloured to your required finish. 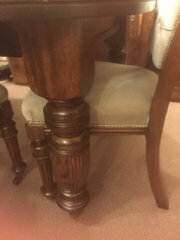 It is fine as it is and would be best just done with a fine coat of wax which allows the original wood finish to be seen.